I finally finished my secret belgian binding book for the swap for the Hinges group. It took me quite a while to finish it. First trying and testing, then working out a concept and when I finally started making the book I ran into several problems. Making me want to cry, but I made it, it's finished and it's ready for shipping =). I made some progress pics, some detailed shots of the finished book and a video, so you might want to go get a cup of coffee for this =). The theme for the swap was "Books", any which way you wanted to interpret this. So I choose "Book of books" and wanted to make the book from an old library discard of the Hobbit. So I ripped it apart. Only to find that I couldn't use the book block. I could use the covers though and cleaned all the plastics off. Then painted them with gold and copper paint. I put the book block aside, figuring I might be able to do something with it. Just wasn't sure what, yet. Made a spine and treated it the same way as the covers with the paints and glued some old dictionary pages to them. And because the challenge at Simon Says Stamp, Monday challenge blog this week is embossing, I will link this book over there as well. Tore the maps from the book block and glimmer misted them, with gold and walnut. Crinkled them and then distressed them with gathered twigs distress ink. Gathered up a bunch of papers. Found out I had run out of tea dyed paper and made some more. Collected some quotes off the internet from my favorite books and authors. Can you tell I am a Sci-Fi/ Fantasy girl? Bound the book together with the same method I showed you in the tutorial. But made a slight alteration to this, because I liked the threads on the covers to keep their triangular shape. To achieve that, I tied the top and bottom threads from the four middle holes together. You can check the video to see where exactly. The book got rather big, but I actually like that. It makes it cuddly. The inside of the book. With the first page of the book block from the Hobbit and a very appropriate ring paperclip =). I also used some rub'n buff on the inside covers and placed the first quote on the front inside cover. I placed the quotes at the top of each first page of a signature. Made some pockets here and there. The first 4 signatures were made with tabs and the last 5 each have a tag sticking out as a divider. The tag also serves as a pocket and on the first of the last 5 signatures I inserted the last chapter from the book... in Dutch, so I doubt my swap partner can read it, but that's ok, she can use it for whatever she wants =). I also included the distressed maps in the tag pockets. And this is the back view of the book. A nice and cuddly book, she can use to write her own story in. Ready to send off, but first I want to cuddle it a bit more, but I'm sure I will have send it off before the 20th september, the due date of the swap. I'm sure she won't mind. Thank you for watching and I wish you all a wonderful week. Anything but a card: Hitting the books (#27), because I used a book to make a book with book quotes and book page inserts. This is a beautiful book, and I love the design of the binding. Lovely, lovely work--I envy your swap partner. Wow das ist ja absolut fantastisch!!!! Eine super Arbeit und es muss sehr schön sein es ganz in Ruhe anzuschauen und alles auf sich wirken zu lassen. LG Dagmar. I know how it feels when you keep running into problems on your way through a project...and I know too how it feels when you have finally overcome them and finished another "master(ed)piece"! LOVE your book and the post too! a masterpiece at all Monique ..I am thrilled! Wow! I wish how I wish I was your swap partner. Beautiful work and very inspiring. Thank you so much for all the lovely pictures. Now I'm off to watch your video. Nou jij hebt zeker een wijntje verdiend! Wow Monique, how lucky is the recipient of this beauty!! Your book-binding is superb sweetie, I am in awe tbh. Lol I don't know If I would be able to part with it, I don't blame you for wanting to cuddle it for a while. What a glorious remaking of your Hobbit book... the gilded embossing, the use of the maps to create elements in the journal, that extraordinary triangular binding - it all adds up to a beautiful creation. What a wonderful book! So much work has gone into this and it shows in the fantastic result. What an interesting binding too! Thanks for joining us for this week's Simon Says Stamp Monday Challenge! Hij is gaaf geworden zeg :D Mooi! 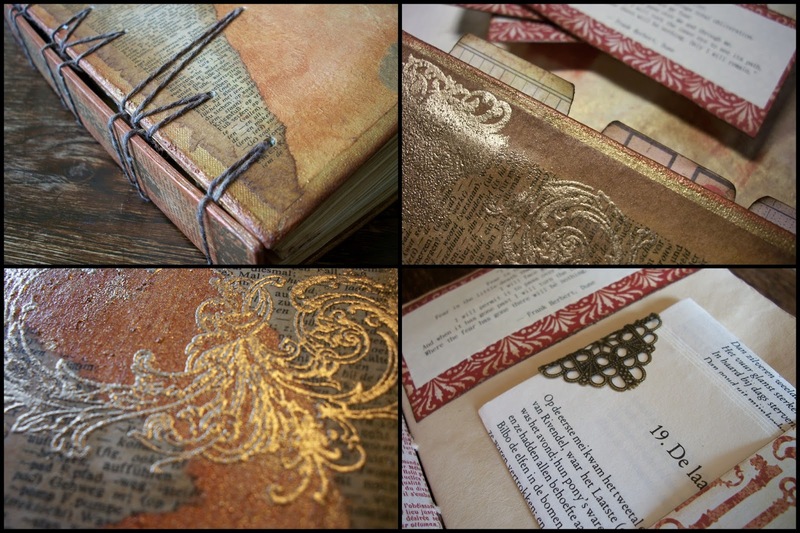 Your book is beautifully made with the lovely binding. I enjoyed so much your description and your video, thank you very much. I don't know how you could possibly send it away. Your book is awe inspiring! The binding really set it off too. I am sure I would want to cuddle it too until the very last moment. Thank you for joining in at Anything But A Card this challenge. Gorgeous! Definitely want to cuddle that book :) Your swap partner is very blessed. Wow! Your book is seriously amazing! I love the gold embossing, and the quotes especially! I found your blog via Pinterest, and I am so glad I did! Your book is beautiful, and so rich in texture and color. Love all the fantasy quotes, as I'm a fantasy girl too :) You just got another follower! Oh that book is to be cuddled indeed! Just fantastic and great video too! Congrats for being in the designer spotlight at Simon says stamp and show. Well deserved! Wow. What a project. So much love and attention to detail. Congrats on your win at SSS. Huge congrats on your spotlight - not surprised, though... this took my breath away when I first saw it! Congrats at SSS! Fantastic book. Your work is gorgeous - your blog is beautiful! Beautiful book and thank you for great inspiration. I need to look at more of your projects. You're good.